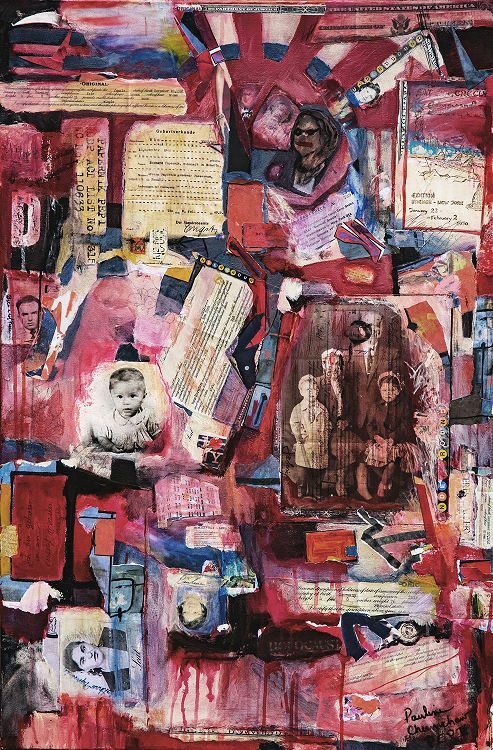 Artist's description: A narrative ... about my parents, brother and me and where we came from and departed from to come to the USA. My ancestral family came from Poland and the Ukraine. They survived the Holocaust and traveled to Germany where they were set up in a Displaced Persons camp in Ulm Germany for a few years. I was born in the Displaced Persons camp. My parents and I, at 2 years old, departed from Bremenhaven, Germany on the USS Greeley in 1950. We came to the USA and lived in Capital Hill (I think it was around 84th St & Amsterdam Ave), Manhattan before moving to Brooklyn, the Bronx, and then Teaneck, NJ. "The Milliners," by Diane Cherr, 2017, letterpress embellished with marker, 10" h x 8"w.
"Ancestors" by Linda Freeman 2017, Acrylic on watercolor paper, 13"h x 11"w.
"Ancestors" by Linda Freeman 2017, Acrylic on watercolor paper, 13"h x 11"w. — with Linda Weinberg Freeman. 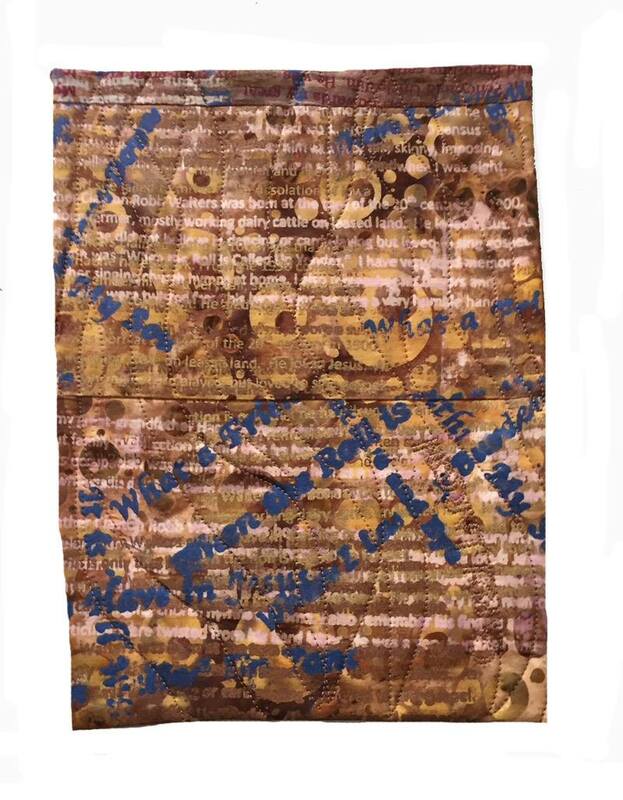 "Dust Bowl," by Carol Larson 2017, textile, 10" h x 8" w.
"Dust Bowl," by Carol Larson 2017, textile, 10" h x 8" w. This is an historical piece created on the theme of the artist's paternal family having fled the dust bowl for California. "Keeping Up Appearances #15," by Carol Larson, textile, 10" h x 8" w.
"Keeping Up Appearances #15," by Carol Larson, textile, 10" h x 8" w. This is an historical piece which depicts Carol's maternal predecessors' obsession with social graces and etiquette. "Jonelle Monae - Feminist," Who's Your Hero Series, by Sara Bunn, 2016, Textile Wearable Art Purse, 8" x 14"
The Foundation was founded by artist, Faith Ringgold in 1999 with a mission to expand the art establishment's canon to include artists of the African Diaspora and to introduce the Great Masters of African American Art and their art traditions to children and adult audiences. In 2002, we celebrated our 501c3 status with our 1st Annual Art Exhibit & Auction hosted by the ACA Galleries, helping us to fundraise and further art programs and award giving. Purchase your early-bird tickets, right now discounted at $35.00, and come on out and enjoy delicious hors d'oeuvres, drinks and desserts. The donation will increase to $40.00 September 30th. We are a 501c3 charitable organization supported by people devoted to the visual arts. Faith Ringgold has selected the theme of "Ancestors" for this years auction. Themed art works should be ; original (no copies or prints) 2-D, 8x10 and unframed. We ask that themed art works are a 100% donation. The themed artwork will be included in a silent auction with a starting bid of $45.00 and will not be returned to the artist (unless the artist comes to collect the work after the auction). Use the themed form for this type of donation. The deadline for submission of all work is, Thursday, Oct 26, 2017. We want your beautiful original art too your work that is not related to the theme too. Works not related to the theme should be, original, 2-D, 36 x 48 or smaller. Please use the general donations form for this kind of a donation. The artist is responsible for shipping, pick-up, etc. The proceeds from the sale works will be shared with you (50%) on a general non-themed donation if you make that request on your form (your option). Send the actual work as soon as you are ready but no later than Oct 26, 2017. Label every art work and include a hard copy of the donation form. In addition please email jpeg and a digital copy of a donation form for each work submitted to Ringgoldfaith@aol.com. 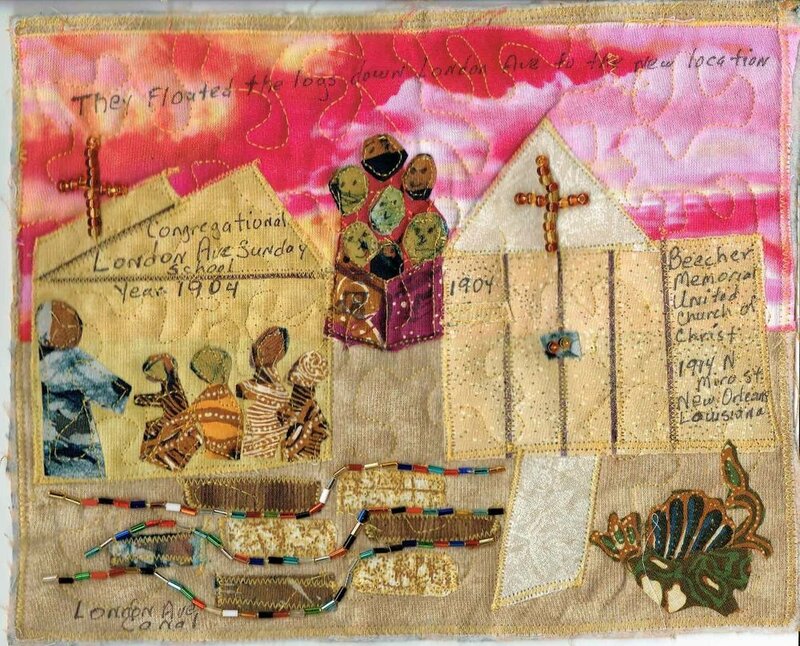 Send art to: Barbara Wallace at 10 West 135th Street, 11-S New York NY 10037. Please let us know that you've sent the art so we can watch for it and so that we can confirm receipt. Option 2: Drop off art work to Grace at 345 West 145th Street New York, NY 10031 on Thursday, October 26, 2017. Call to set up and confirm drop off. My cell number is 858 735-0687.